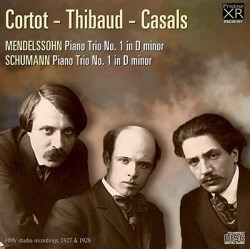 I reviewed precisely this coupling many years ago in its appearance in Naxos’ series of discs devoted to the recordings of the Cortot-Thibaud-Casals trio (see below). They are amongst the most famous and oft-reissued series of pre-war chamber music sets. What follows is a reprise of that review and then a few words about the new transfers will follow. When an admirer thrust a tiny scrap of paper into his hands and asked him to write something the French violinist Jacques Thibaud, at a loss, turned nonplussed to a colleague and shrugged despairingly. "Just write your repertoire, Jacques," he was told. Or so it’s said. It’s true that Thibaud’s repertoire was small and so was that of the Trio of which he was a member for twenty-nine years. The trio began in 1905 in Paris, at first privately and then with increasing success and enthusiasm the three began to give soirées and then the first of their concerts, in 1907. The extent of the works they performed was, in fact, precisely thirty-three of which at least half were discarded after a few or even just one performance. This, in essence, meant that they had as their core repertoire the Beethoven Op 70, Schumann Op 63, Mendelssohn, Haydn G Major and Gypsy Rondo and Schubert B Flat. Their last performance, in 1934, was a private one, in Florence, after which Casals, now too busy, gave up his place, which was for a time filled by Pierre Fournier. Casals’ political views led to the later famous breach with Cortot and Thibaud; Cortot, who had played concerts in Germany during the War, apologized and was forgiven, whereas Thibaud declined to genuflect to Casals and was not. Their London debut came in 1925 and was followed over the next few years by recordings of their major works. They have all been reissued many times in differing couplings. Here the Mendelssohn from 1927 is coupled with the Schumann which was recorded the following year, entirely apt disc-mates and a good start to what will be Naxos’s traversal of the complete trio recordings. These famous records show how disparities in tonal weight are not necessarily prohibitive of lyrical phrasing, how Thibaud’s beautifully elegant but concentrated sound contrasts with Casals’ big tone. Not the least of the contrasts comes in passages in which the fixity of the cello bass line underpins Thibaud’s spinning of a melody, accompanied all the time by Cortot’s triumphant pianism. The opening of the Mendelssohn is a case in point – with Casals deep, rather gruff lower two strings and Thibaud’s quick, light tone making their unique tonal blend. Thibaud’s portamento here is not only quite characteristic of him but it’s also entirely in keeping with their Mendelssohn playing which is romantic and flexible. The violinist’s playing of the passage from 5:10 in this movement is ravishingly beautiful. In the Andante Cortot animates his partners with his acute rhythmic left-hand accents and there is an unforced almost spontaneous elegance to the ensemble. There is much propulsive warmth in the finale with the unison passages almost revelling in those tonal disparities between the string players. The Schumann, a more elusive work, is notable for the metrical freedoms of all three musicians in an opening movement which is both slow and involved. There are some superb sonorities in the more mysterious sections of the first movement with all scaling down their playing to prodigious effect. The slow movement is broad but well sustained whereas the finale is quiveringly vital, with some real con fuoco phraseology and a momentum that surges towards a grandly rhetorical conclusion. Naxos used transfers by Ward Marston, which were excellent and had notes by Tully Potter. For Pristine’s XR transfer Andrew Rose has pitch-stabilized and Rose notes that the re-mastering has done ‘great service’ to the instruments’ tonal qualities. There’s less surface noise on the Pristine transfer and the instruments are more centred, but I’m not sure I’d necessarily trade that for the more cramped aural picture in the Mendelssohn. The Schumann gets a big-scale transfer but the surface noise has been well dealt with, although there’s a slightly torrid quality to the sound.